Join Winemaker Kiley Evans of Ledger David Cellars for a special harvest dinner at Liquid Assets Wine Bar in Ashland on Tuesday, November 11 at 6:30pm. The event features seasonal gourmet menu items paired with a selection of Ledger David wines including the latest release of our signature Primoris Chenin Blanc and our exclusive 2010 Tempranillo Reserve. $70 per person (plus tax & 18 percent gratuity). Reservations Required. Limited Seating. For more info or to make a reservation, call (541) 482-9463 or email denise@liquidassetswinebar.com. New Sammy’s Cowboy Bistro located in Talent, Oregon is said to have transformed America’s dining. This roadside restaurant between Ashland and Talent uses organic ingredients, many of which come from the garden beside the restaurant and offer a seasonally exclusive menu. Owner Charlene Rollins heads the tiny kitchen, turning out refined organic dishes, while her husband, Vernon, handles the astounding 3,000-plus-bottle wine list which includes Ledger David’s Sangiovese Rosé. Make a reservation today for an affordable and unique experience. 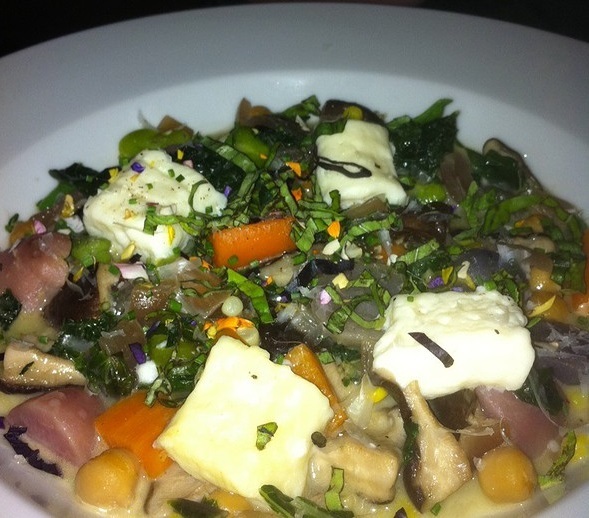 “Our Gnocchi is my go to pairing for Ledger David Sangiovese Rose,” says Vernon, owner of New Sammy’s. Open Wednesday – Saturday: 12:00 – 1:30pm, 5:00 – 9:00pm. Winemakers read. Some of us read fiction, some read biographies, but invariably we all read about wine in some way at some time. People, really smart people, all over the world write on Grape Growing, Wine Production, Wine Branding, Wine Marketing, Wine Sales, Wine Inventory, Wine and Climatology, Wine and Geology, Wine and Soil Science, you get the idea. I read about wine and the wine industry more that I probably should, but it’s almost an escape for me at times. A few months ago I was reading about the Aesthetics of Wine and ran across a great line that provoked me. “Many of the world’s most profound places for growing wine can be filtered down to two ideals, a warm spot in a cool climate or a cool spot in a warm climate.” Remember, in the Northern Hemisphere the south- to west-facing slopes are hottest while north- to east-facing slopes are cooler than flat land (in the Southern Hemisphere the north-facing slopes are warmest). I started thinking. Where are the world’s great places for wine? For argument’s sake let’s take a look at Germany. Riesling is the grape, of course, but where in Germany exactly? Germany has the world’s most northerly vineyards, but take a close look at a map of Germany’s greatest vineyards, its Grand Crus. Practically all of them lie along a river, the Rhine and Mosel, on steep, south-facing slopes with slate soils. Why? What makes those places so special? The answer lies in a unique combination of factors. The rivers moderate the temperature. The slopes intercept more sunlight and thus heat that the surrounding flat lands. The slate soils warm rapidly and then radiate that heat back into the vines as the temperature falls after the sun goes down. In other words, it’s a warm spot in a cool climate. Check out the Doctor vineyard above the town of Bernkastel along the Mosel River. Now take a look at our own Rogue Valley. We have what most would consider a moderately warm area. In such areas the cooler spots tend to be at higher elevations, shaded, such as at the base of a cliff, and/or oriented away from intense direct sunlight. So here we are at a time of year that would normally be the middle of harvest, but this has been one of the hottest years on record for the Rogue. 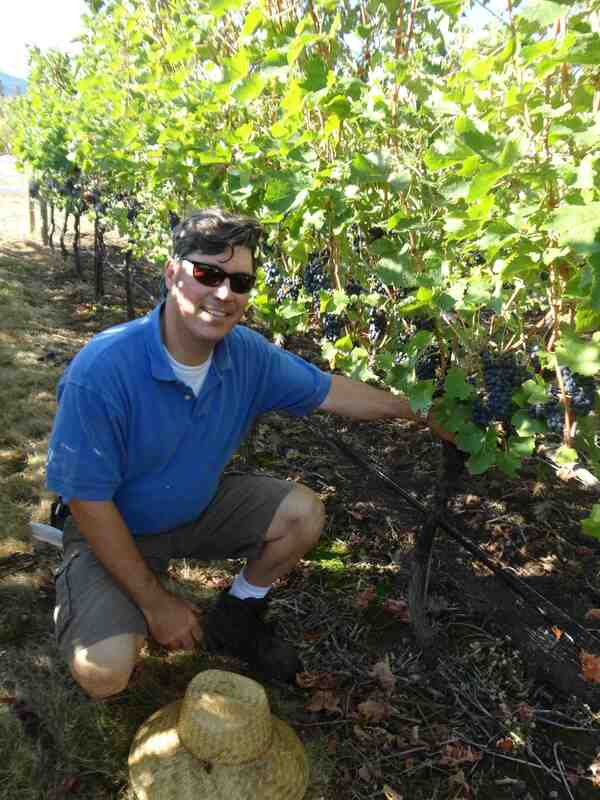 As a result, nearly all of the valley’s wine grapes have been harvested. But not at Ledger David Cellars. What? Everyone else has picked but us? What are we doing wrong? What is happening? Well…our estate vineyard ranges from 1,844 to over 1,975 feet elevation and enjoys eastern and northeastern exposures. The result? 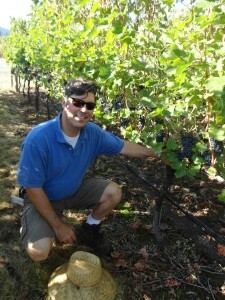 We are quite a bit cooler than most other vineyards and that results in a much slower, more even ripening of the fruit. Our site also allows us to achieve maximum “hang time”, a term in grape growing and winemaking that describes the seasonally late time frame in which the grapes ripen enzymatically without increasing in sugar content. Essentially the grapes develop aromatic complexity while the flavor compounds intensify. Late season ripening doesn’t happen very easily, if at all, if the grapes are exposed to the direct sun. They tend to raisin and take on a cooked fruit quality that isn’t necessarily desirable in wine. But on our elevated slopes the vines are gently warmed by the morning sun and caressed by afternoon shade. In other words, it’s a cool spot in a warm climate, and that is one of the things that makes it so special. The calendar has indicated the last day of summer has come and gone. The hot temperatures and dry conditions should now wane to cool evenings, foggy mornings, and yards full of morning dew. To the eye, the changing season is in full effect, with the slow turn of fall colors in the trees. However, the temperature, the fog, and morning dew have not gotten the message it seems here in Southern Oregon, as we are still in the throes of 90-degree days, with the lingering smoke from summer forest fires in the air. As a person who loves fall, and all the majesty the season brings, something had to be done. I could not sit idly by with the air conditioning running, simply surviving a fall day disguised as a day in August. It was time to perform a rain dance…a culinary rain dance. I was armed with the hearty, earthy flavors of lamb, white beans, and vanilla. Along with an arsenal of some of the best wines the Rogue Valley has to offer, I was now prepared for this season changing ritual. The first part would begin with a boneless leg of lamb, rubbed inside and out with lemon, garlic, shallot, and rosemary and destined for a slow and low roasting in the oven. Then it was finished off with a sauce made with drippings from the lamb and the 2011 Dark Night red blend from Ledger David. 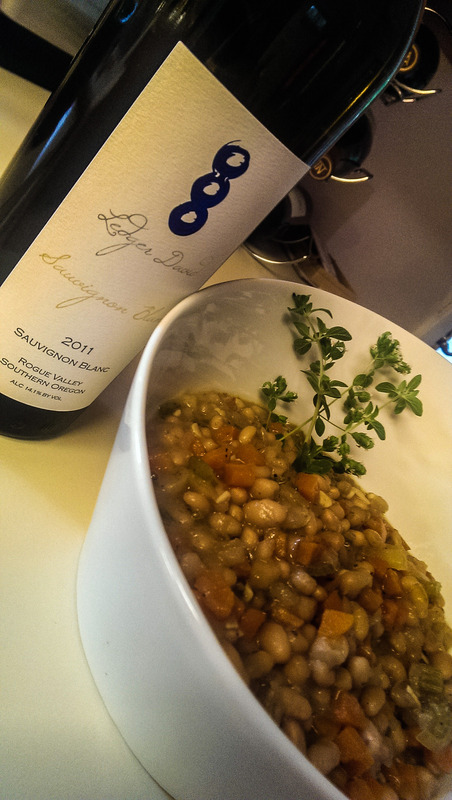 The second part would have white beans, joining some 2011 Ledger David Sauvignon Blanc, a mirepoix, chicken broth, and herbs to simmer and cook into a creamy side dish with all the flavors of fall. The final part of this rain dance is dessert. Whole vanilla bean is split and seeded, and joined with custard to be transformed into gelato. A whole bottle of 2010 Tempranillo Port from Ledger David is emptied and reduced over low heat to create a syrup flavor bomb of mass destruction, which is drizzled over the vanilla gelato. The end result is a house full of amazing fall aromas, and a meal that would convince the ever-fickle Mother Nature that fall is indeed here, and to herald in this glorious season. Did it work? Well, the weather forecast is for rain and cooler temperatures so, you be the judge. 1 whole boneless leg of lamb 3-5lbs. Place oven rack on lower middle position, and preheat oven to 275 degrees. While oven is heating up, heat olive oil in a small saucepan over medium heat. Add garlic, shallot, rosemary, lemon zest, and red pepper flakes. Cook, stirring occasionally, until shallots and garlic are softened, about 5 minutes. Transfer to a small bowl, add salt and pepper and mix to combine. Rub half of mixture into inside of butterflied lamb leg. Roll leg and tie securely with butcher’s twine. Rub remaining mixture over exterior of lamb. Cook immediately or let rest uncovered in the refrigerator for up to one night for best flavor and texture. When ready to cook, place lamb on top of large carrots in the bottom of a heavy enameled cast iron French oven, or Dutch oven. Placing lamb on top of the carrots keeps meat from burning on the bottom, and keeps meet out of the rendering fat. Transfer to oven and roast until an instant read thermometer inserted into coolest section of lamb registers 125° to 130°F for medium-rare, or 130° to 135°F for medium, about 3 hours. Remove from oven and let rest for 40 minutes. While lamb is resting, increase oven temperature to 500°F. 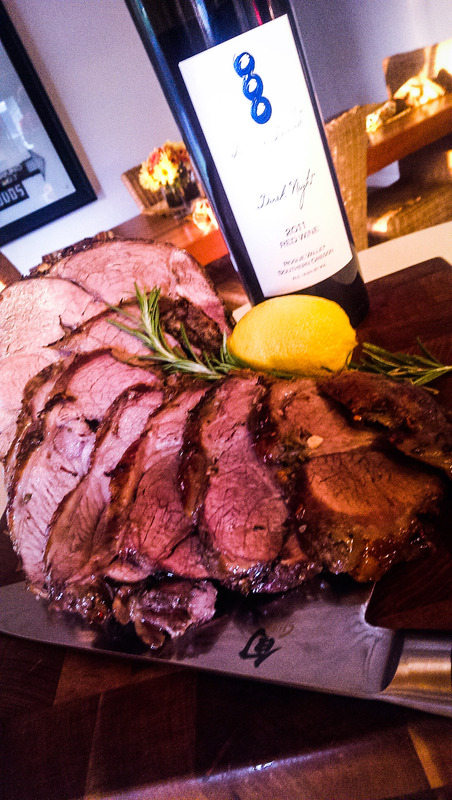 Place lamb on a wire rack or directly on oven rack with a rimmed baking sheet underneath to catch any drippings. Return lamb to oven and roast until exterior is deep brown and crisp, about 15 minutes. Remove from oven and let rest 5 minutes. Remove twine with kitchen shears, transfer lamb to cutting board, slice into 1/4 inch slices, and serve, along with a glass of 2010 Dark Night. Gather all drippings from lamb and separate fat by using a fat separator or letting cool and spooning the fat off the top. Return drippings (minus fat) to small sauce pan and bring to a boil. Once boiling add Dark Night, reduce heat and simmer for 2 minutes to remove alcohol. Take corn starch and dissolve in a small amount of water or wine, and add to sauce stirring constantly. Once sauce has simmered, and has reached a thicker consistency but not too thick, add butter and salt pepper to taste. Pour over lamb slices. In a saucepan, heat oil over moderately high heat until hot but not smoking and cook onions, carrots, celery, and garlic, stirring, 2 or 3 minutes, or until softened. Add white and bring to a boil for 2 minutes, or until the wine is reduced by half. Add beans, 2 cups broth, butter, and bay leaf and cook over moderate heat, stirring occasionally and adding enough remaining broth to keep beans moist and to reach a creamy consistency, about 30 minutes. Discard bay leaf, salt and pepper to taste. Homemade vanilla ice cream or Gelato or your favorite store bought French vanilla ice cream. Pour entire bottle of port into a small sauce pan. Simmer port under low heat until reduced to roughly ¼ cup, stirring occasionally. This will take about an hour. Keep your eye on this, especially as you get close to the end, as you can burn the sauce, if it gets too hot. Serve warm, drizzled over ice cream, with a small glass of the port.